Despite seemingly lackluster sales for the M-rated fare it has released on the Wii, Sega isn't ready to abandon publishing mature games on the family-friendly console yet. Sega has been one of the most prominent publishers when it comes to pushing mature content into the family-friendly library on the Wii. 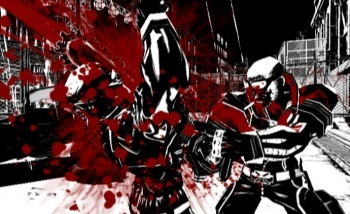 MadWorld and The House of the Dead: Overkill alone provided the console with more gore-filled gaming than most of its library combined. Being ballsy doesn't always pay off, and both titles failed to make a big splash when it came to the sales charts. Sega, however, doesn't see mature games on the Wii as an endeavor they're ready to abandon, or one that has even really failed yet. "House of the Dead: Overkill was a profitable title for us," Gary Dunn of Sega Europe said. "Whilst it had a rather sharp tail at full price, they do bubble away at a lower price point for a long time." Dunn doesn't exactly say the same thing for MadWorld, but he believes in the idea behind the game. "You have to push boundaries and explore," he said. "I think whilst MadWorld commercially didn't sell well what were expecting I wouldn't say it's game over for mature Wii titles from Sega." Sega, then, is pondering its next move. "We're taking a look at the resources we have now," Dunn said. "We've got money to invest in development, we're just considering where to invest it next." MadWorld 2? Even though Sega's looking to push the envelope, I'd still be surprised if it happened.